The innovative and beautifully crafted PowerBlock Personal Trainer Set, 5 to 50 Pounds per Dumbbell set is changing the game of at-home workouts. Their unique design, compact, adjustability, and high reviews have helped make it one of the best adjustable dumbbells on the market. But are these top rated adjustable dumbbells worth the money? Are they something you can use and gain from when it comes to your training program? There is no question that the market for dumbbells has exploded the past few years. Presently, you can find hundreds of different brands and types of dumbbells to choose from. That makes selecting one much more difficult. The best way to narrow down the selection process is by determining what makes a particular set different from the others. By doing so, you can pinpoint the features and see if they are right for you. And you can also see if they are worth the money or are just the same as others being sold. In truth, if being different or unique was reason enough to purchase an adjustable set of dumbbells, then these are worth buying. That’s because their innovative design sets them apart from most available today. The five stars rated PowerBlock Personal Trainer Dumbbell set forego the norm. These are not the old kind of dumbbells you are used to seeing in a gym. For one, they are square and look like a pair of blocks; not round like other dumbbells. They also have color coding to make the weight increment selection process much easier for you. Unlike traditional dumbbells, the PowerBlock Personal Trainer set is exceptionally compact. At the same time, they provide more balance than other sets out there. Aesthetics can only go so far when it comes to any product. While how they look is important, it is not the main reason for purchasing them. This is more so when it comes to a product you will use, as opposed to just looking at it. Although the PowerBlock Personal Trainer Set gets highs marks for its design, that is not what makes it such a great set of dumbbells. As with any adjustable dumbbell, what it can do for you during your workout is what matters. How much time, space and benefits do it render? Right off the bat, users will enjoy the space saving design. With a set of PowerBlock Personal Trainer adjustable dumbbells, the need for additional dumbbells is eliminated. That’s because you can go from 5 to 50 pounds in no time with these sets. They render a maximum of 50 pounds per set on each hand. That is not the best thing about them. What sets the PowerBlock Trainer apart is the adjustability feature. These sets are unlike many adjustable dumbbells out there which can only make weight increments of 5 pounds at a time. Instead, you can make weight adjustments at 2.5 pounds per set. This is crucial since it allows you to move up in weight 5 pounds at a time when using two dumbbells. Another feature you will love about the PowerBlock adjustable dumbbells is how easy you can adjust the weight. The unique selector pin allows you to change the number of loads easily and quickly. 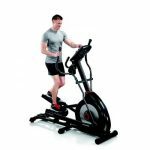 That will enable them to make your workout sessions much more efficient. 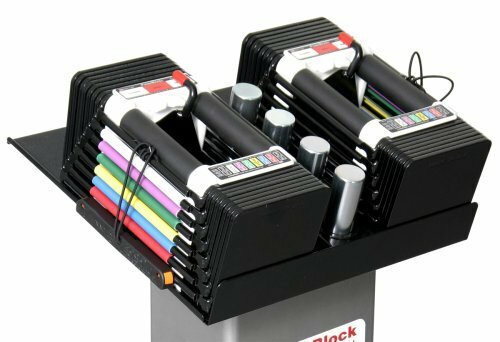 Are The PowerBlock Personal Trainer Set Right For You? The most important factor to consider when purchasing adjustable dumbbells is knowing whether or not they are right for you. When it comes to adjustability, these are at the top. As far as workouts are concerned, there are countless exercises you can do with the PowerBlock Personal Trainer Set. Because of their capability to adjust at 2.5-pound increments, the number of practices goes up even higher than other sets. You can do concentration curls, hammer curls, standing curls, incline bench curls and lying triceps extension, among others. There are also several shoulder workouts you can do such as abs crunch, flat chest press, flat fly, squat, incline fly and more. And you can do shoulder exercises such as seated overhead press, shrugs, front raise, standing shoulder press, and additional ones. The only problem you may have is getting used to the innovative design on these sets. However, once you begin to play around with the selector pin, it is straightforward to get used to. Pulling on the selector pin to change weight increments is a cinch. Their comfort level is also something many people enjoy them. This is important when determining if an adjustable dumbbell set is right for you. Other things which make this set right for most people is their heavy-duty construction. Since dumbbells will endure a lot of usage and punishment, that factor is crucial. “LOVE these dumbbells” is what a user wrote in his testimonial about the PowerBlock Personal Trainer Set. He also said he could not be happier with his purchase since they make his workouts so much easier. Another user exclaimed that he “Could not be more pleased” in his 5-star review of the PowerBlock adjustable dumbbells. He also boasted about how easy changing the weight increments was. Then there was a verified purchaser who said “Five Stars” and called them the perfect adjustable dumbbells for home workouts. Choosing adjustable dumbbells can be a daunting task if you don’t know what to expect from them. However, that changes once you have a set that has already been proven to deliver. When they are based on hundreds of reviews and customer testimonials, the decision becomes more comfortable. The bottom line on the PowerBlock Personal Trainer Set is that they provide what they set out to do. That is to make your workouts more comfortable, effective, efficient and faster. Also, they eliminate the need for additional dumbbells thus saving space. You also have how easy they are to change their weight increments. And their compactness, durability, 10-year limited warranty and design. The only drawback is the price which is a bit higher than other sets. But, those which cost less do not provide the same features or design. In all, based on the many positive customer reviews and overall score, these are highly recommended.